δ-Hyperbolic metric spaces have been defined by M. Gromov in 1987 via a simple 4-point condition: for any four points u,v,w,x, the two larger of the distance sums d(u,v)+d(w,x),d(u,w)+d(v,x),d(u,x)+d(v,w) differ by at most 2δ. 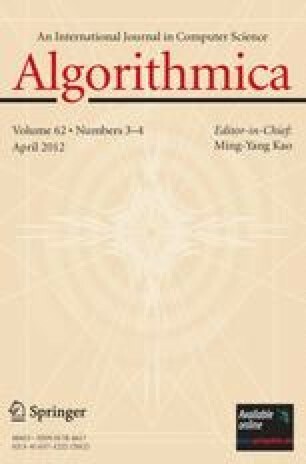 They play an important role in geometric group theory, geometry of negatively curved spaces, and have recently become of interest in several domains of computer science, including algorithms and networking. In this paper, we study unweighted δ-hyperbolic graphs. Using the Layering Partition technique, we show that every n-vertex δ-hyperbolic graph with δ≥1/2 has an additive O(δlog n)-spanner with at most O(δn) edges and provide a simpler, in our opinion, and faster construction of distance approximating trees of δ-hyperbolic graphs with an additive error O(δlog n). The construction of our tree takes only linear time in the size of the input graph. As a consequence, we show that the family of n-vertex δ-hyperbolic graphs with δ≥1/2 admits a routing labeling scheme with O(δlog 2 n) bit labels, O(δlog n) additive stretch and O(log 2(4δ)) time routing protocol, and a distance labeling scheme with O(log 2 n) bit labels, O(δlog n) additive error and constant time distance decoder. The results in this paper have not appeared before in conference proceedings, with the exception of distance approximating trees (Proposition 2, Proposition 4), which appeared in a preliminary version in proceedings of SoCG 2008 . V. Chepoi, F.F. Dragan, B. Estellon and Y. Vaxés were supported in part by the ANR grant BLAN06-1-138894 (project OPTICOMB). Y. Xiang was supported in part by the NSF under Grant #1019343 to the CRA for the CIFellows Project.